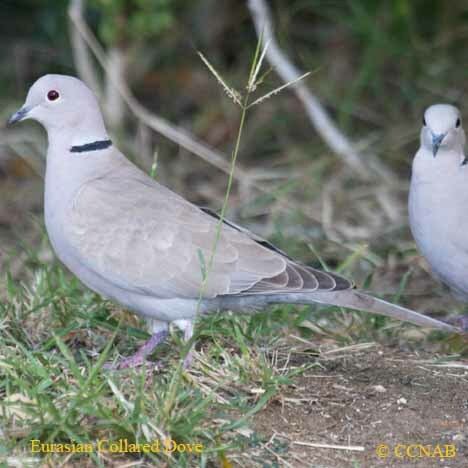 Species: The Eurasian Collared-Dove (Streptopelia decaocto) is a fairly new bird species, recognized as breeding in North America. 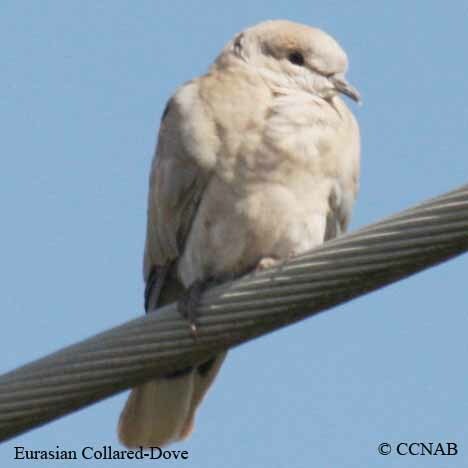 This bird's original origin is sought to be in southern Asia, where overtime expanded into Western Europe, becoming a common sight throughout all the countries. Its entry into North America is said to be through the Bahamas, where a breeding colonies developed, and from there into Florida. 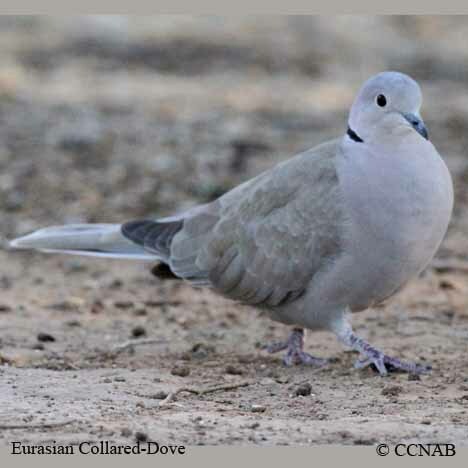 These dove do not show tendencies to migrate, but instead, expand, branching farther north and west every year. 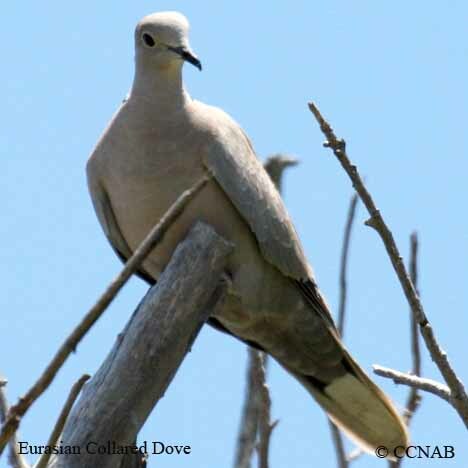 At this time there has been reports of this dove seen even in the State of Alaska, and sighted every year in eastern Canada. 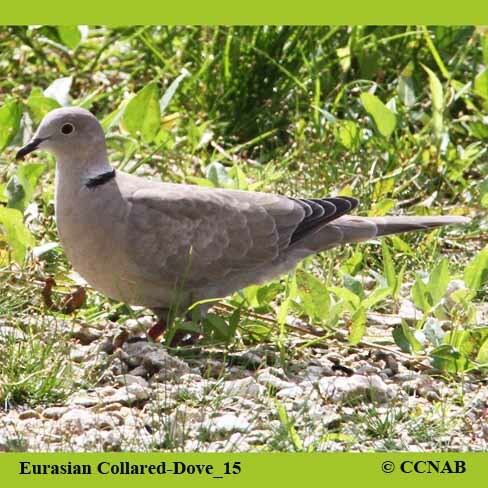 Distinctions: Adults are similar in appearance, larger in size than a Mourning Dove (Zenaida macroura). Soft gray in colour, light brownish tone back, semi black collar encompassing the nape. Dark primaries, mid areas of upper wings are grey, including the secondaries. Black areas showing at the base of the tail, large white terminal band. Orange legs and feet, dark red eyes, with white orbital ring. Juveniles similar to parent, except not as well groomed. Voice: Distinct call, repetitious cooing, sound as such, "cooo cooo cooc". Nesting: Two to three white eggs, three to six broods per year, depending on food supply and weather conditions. Nest built in trees, composed from branches, sticks and feathers. Male can be seen in breeding season doing specific aerial flights, where after gaining height, with fixed wings, glide back to the ground in a circular flight pattern. Distribution: In a matter of approx. 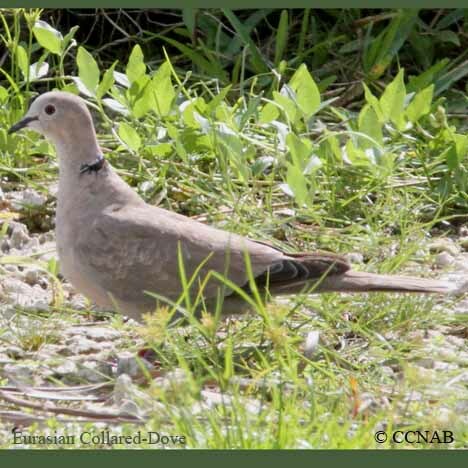 30 years, this dove has been sighted in southern Ontario, west, across the southern portions of the prairies, to a few sighting in Alaska, to southern California, east, across all the states to the tip of southern Florida, north to the US and Canadian Atlantic border. Now being seen through all of Mexico, and into Central America.